Fork Attachments (FA) from BHS slide easily and securely onto lift truck forks. These industrial-strength accessories give lift trucks the ability to handle heavy loads with overhead, single-point lift designs. Fork Attachments offer a low-cost, high-value solution that’s ideal for maintenance tasks on vertical-extraction forklift battery fleets. The FA comes in two models to match any battery collection. The FA-2.5 affixes securely to a single lift truck fork, safely handling loads up to 2,500 pounds. The FA-6 is a heavier-duty Fork Attachment, which secures to both lift truck forks simultaneously. It can lift loads up to 6,000 pounds. Both models are crafted from heavy-duty steel. They’re finished with an acid- and impact-resistant powder coating that’s ideal for industrial environments. 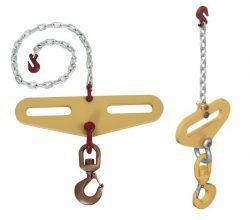 Integrated securing chains lock to the fork carriage, providing another layer of stability to the entire lifting apparatus. Fork Attachments come standard with a powerful spring-latch hook, ensuring a dependable seal. Contact the factory to discuss other options on hook designs for all BHS Battery Lifting Devices; just send an email to sales@bhs1.com to get started. High-capacity battery rooms will need a full Gantry Crane system, complete with a Battery Lifting Beam, to handle the demands of everyday battery change-outs. However, Fork Attachments provide an excellent solution for removing forklift batteries during maintenance or other occasional purposes. Call the BHS sales team at 1.800.BHS.9500 to find a dealer near you.